Every other Wednesday I get together with a group of women for tea. It is an exclusive - by invitation only - kind of party. It's amazing that this diverse group of women have so much in common. No one puts on airs. The PHD holder is just as important as the woman who works for Head Start. We come together and share our lives, our families,our failures and our victories. But most of all; We laugh. 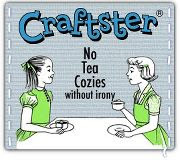 Not polite little giggles behind our cloth napkins. I am talking about a full blown belly laugh. The kind where it's just a matter of time before the tears show up. Laughter is music to the soul. It is healing to the body and freeing to the mind. It releases all the toxic negative emotions we hold inside and replaces them with positive healthy emotions. When is the last time you laughed? 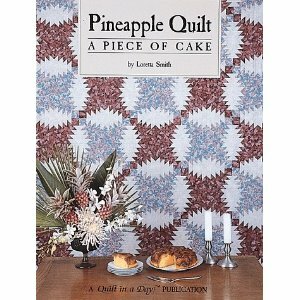 Tonight a few of the ladies got together and began the process of creating Pineapple Quilts. We are following a design from this book. Since we are not experts ( yet we are committee chairs for our local Quilting Guild ) it should be interesting. I will keep you up to date on our progress. Muslin Petticoat with appliqued butterflies. 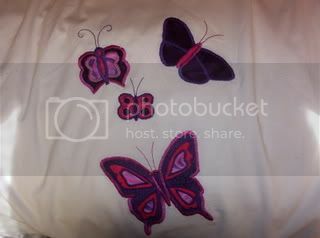 Each butterfly was hand drawn and layered onto the petticoat. A satin stitch was applied to each individual piece. 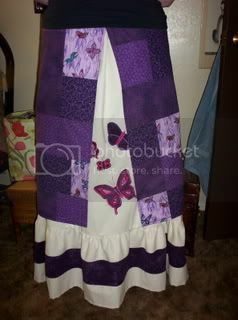 This is the patchwork apron that is then worn over the petticoat. It is tied with a bow that loops around to the front of the apron. 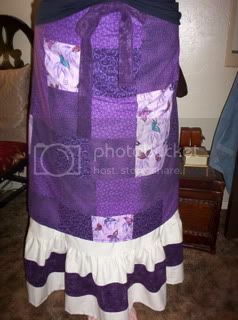 This petticoat and apron skirt sold for $150.00 to a head shop in Mendocino County California. I can't imagine what their mark up was. I hope whoever bought it loves it and wore it to the festivals this summer. I have so many UFO's ( un-finished-objects ) floating around my house. I estimate between 20 to 30 projects have been put aside for whatever reason. I need to get busy. 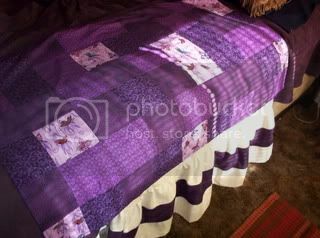 I have two baby showers, the community quilt project, a new bag design proto-type that needs to be put to paper, a new quilting class starting Wednesday, pictures to take, inventory to add to shop.....The list goes on and on. This week I want to take five things from my pile and finish them. 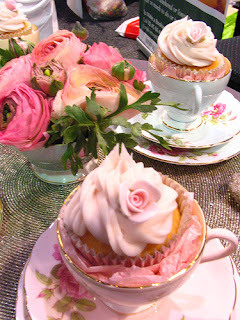 Even if it is as mundane as hammering on snaps or adding a ruffle. That is my goal and I have seven days to do it. Check back next week and see how I did. Done With Dawdlin' - Link Up! Brandi over at The Well Blessed Woman Blog has started an Anti-Procrastination link-up. What is an Anti-Procrastination link-up you ask? I will let Brandi explain click here. 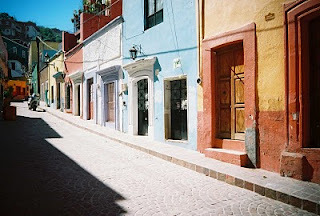 For my first task, I want to learn how to link to other places on my blog. I know some of you may be rolling your eyes with a side of tsk-tsk, but I'm serious. I need help! Brandi, being the wonderful, bright, intelligent woman that she is, sent me a tutorial on how to do this. I wanted to join the link-up but had no clue how to follow the rules when it came to the links. She took me by the hand and taught me how to link. Yay for me! I will know if I succeeded when I post this and link it to The Well Blessed Woman Blog. Post Edit : It took me two times to get it right! "Not very long," said the fisherman. "I sleep late, fish a little, play with my children and take a siesta with my wife. In the evenings, I go to the village to see my friends, have a few drinks, play guitar and sing songs... I have a full life." The American interrupted "I have an MBA from Harvard and I can help you! You should start by fishing longer every day. You can then sell the extra fish you catch. With the extra revenue, you can buy a bigger boat. With the extra money the bigger boat will bring, you can buy more boats until you have an entire fleet of trawlers. Instead of selling fish to the middle man, you can go directly to the processing plant and maybe even own your own plant. Then, you can leave this little village and direct your enterprise from Mexico City or even New York City! "Twenty, maybe 25 years." replied the American. "Afterwards? Then it gets really interesting." answered the American, laughing. "When your business gets really big you can start selling stocks and make millions!" "After that, you'll be able to retire, live in a tiny village near the coast, sleep late, play with your children, catch a few fish, take a siesta, and spend your evenings drinking and enjoying your friends!"